I’ve spent years as a biotech cheerleader, trumpeting the idea that biology can power innovation across diverse industries. Lately, I’m getting the feeling that experts in lots of other fields are also taking up the cheer. Case in point: Techonomy, the annual conference in Palo Alto that explores how technology is integral to the economy in which we live. 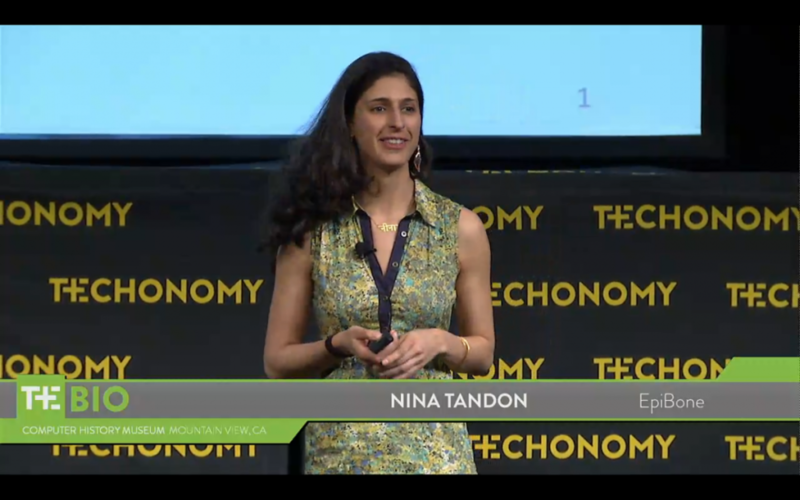 At this spring’s conference (where I had the pleasure of presenting), organizers added a nice suffix to the event name: Techonomy BIO! The lineup of thinkers was practically proof in itself of how widely biotech’s influence is poised to spread. Speakers included policymakers, investors, entrepreneurs, biohackers, architects, and media. And the event format — short solo presentations interspersed with lively panel discussions — was engineered to encourage a remixing of ideas. Cortexyme: new approach to treating Alzheimer’s from a pathogenic perspective. Modern Meadow: using tissue engineering techniques to grow meat and leather. G-Tech Medical: wireless patch to help clinicians diagnose gastrointestinal disorders. I admit, I caught the infectious sense of enthusiasm about the possible — we have new hope of confronting grand challenges in sustainability and health once we consider biological systems as a technological partner. However, I was also heartened to hear the techno-optimism tempered with consideration of the potential Pandora’s box, especially as the pace of discovery is picking up. Jeanne Loring of the Scripps Research Institute warned of the dangers of unregulated stem cell treatments and the likelihood of their proliferation given the lack of enforceability of patents and the ease with which it’s becoming to perform biotechnology methods such as genome reprogramming (as an aside, she mentioned that she’s now training high-school students to do the work that graduate students performed just a decade ago). I also heard widespread concern about how the pillars of science — the NIH, science curricula — can keep up, especially with relentless budget cuts. In order to balance the risks and rewards, a consensus emerged that scientific communication can play a key role for reaching to communities beyond academia to help us process the new challenges. The idea here is that, if Pandora’s box is open, this critical conversation can’t just be happening in the lab. It needs to extend into the blogosphere, onto the street corner, and maybe into your neighborhood biohacking space! I couldn’t agree more. For example, Greg Matthews, founder and managing director of MDigital Life, pointed out the particularly important role that doctors may play as media content creators. Doctors, he noted, are very concerned about the scientific validity of new medical technologies, and they’re driving the online conversation about genetics. This blog is part of that trend: scientists as a source.